What can you say about Bermuda? First, there is no getting around it: Bermuda is isolated and tiny. It’s about twenty miles across, only a mile wide at its widest point and shaped like a fishhook. We got conflicting accounts on its geological history. One account says it is volcanic in origin and it sits on the caldera of a long extinct volcano. The other account is that its land mass is essentially crushed coral reef, which over millions of years of pressure hardened into Bermuda limestone. 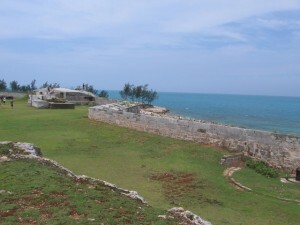 This makes Bermuda fairly squat as islands go, with its highest point only a couple of hundred feet above sea level. Both of these scenarios sound plausible. Second, they drive on the wrong side of the road, unless you live in that part of the world where left is the right side of the road. No superhighways here. If there is a four lane road on the island I must have missed it. The roads are uniformly narrow. It’s a good thing you cannot rent a car here. Those of us from the states would end up injured or dead from clipping cars coming the other way. Bermudans are limited to a single car by law, unless you happen to be a physician. The very idea would raise the hackles of any true blooded American but in truth one car is plenty. First, there are only so many places you can go in a car. Second, when you get there you may have trouble finding a place to park your car. Third, the public transportation here is ubiquitous and relatively cheap. Traffic is limited to 35 kph (about 20 mph) by law. For those who need to get around more quickly, there are water taxis that are also quite affordable. Third, Bermuda is not for cheapskates. It is part of the British Commonwealth. Gas runs in excess of eight dollars a gallon, which explains why all the cars are compact and fuel efficient. Bermuda does have its own cows and dairy but there is not a whole lot of land for them to graze. With a population at about sixty thousand, every time a cruise ship like ours comes into port, its population grows by five percent. Given this reality and the regular arrival of mega cruise ships, you would think that tourism would be its primary industry. Instead, offshoring appears to be their principle industry. Bermuda specializes in hosting companies like HBC Financial that make most of their money on the mainland but don’t want to pay taxes in the United States. The only city on this island, Hamilton, is clustered with buildings hosting offices for companies like HBC. Presidents and CEOs of these companies of course cannot live just anywhere in Bermuda, so they have pricey estates starting in the millions of dollars, often with private docks, personal chefs and housekeepers. A few grandfathered people have estates on some of the islands in the Great or Little Sound. So in some ways Bermuda resembles Hawaii, both for its high cost of living and its remoteness, but also because people of more modest means who keep the gas stations and food stores running are stretched. The cheapest houses in Bermuda start around $400,000. Fourth, Bermuda is humid and warm. It may be at the same latitude as South Carolina, but the Gulf Stream runs right by it, pushing warm water and stifling humidity with it. 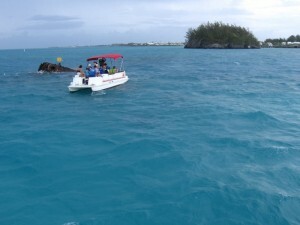 This gives most of the water in and around Bermuda a delightful aquamarine color. Its isolation keeps the waters clear as well. Thankfully in August the temperature rarely gets into the nineties, but with the air almost always constantly saturated with water, you are likely to be sweating while outside. Fortunately, most of the time there are also steady tropical trade winds, which makes the humidity bearable, providing you are positioned so you can feel them. Officially Bermuda’s climate is subtropical, but it feels tropical. The vegetation is lush and everywhere. The palm trees are fewer and smaller than islands closer to the equator but there are flowers everywhere free for the picking. The aloe plant is native to the island, as its properties to reduce the pain from the sunburn were quickly discovered. Its beaches are famous for their pink sand, but to actually see it you have to dig a foot or so into the beach. Fifth, Bermuda is a beautiful place. Of the places I have seen in the Caribbean, Bermuda is more beautiful than any of them and arguably more livable. There are no snakes in Bermuda and nothing in the way of mosquitoes either. It’s a wholly sensible island, doubtless due to its British influence. 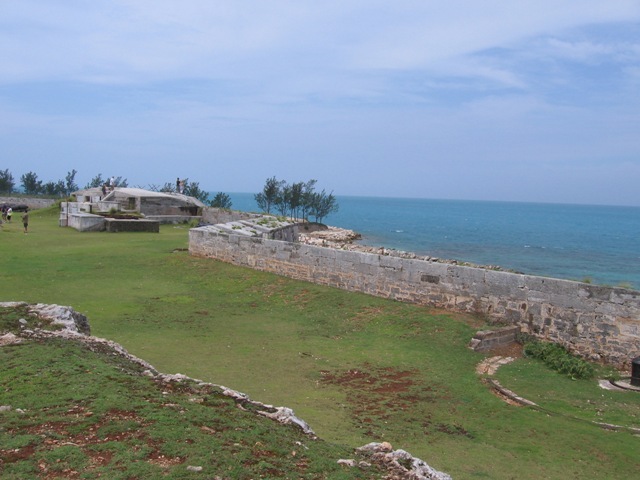 Bermuda became strategically important to Great Britain after Americans won the Revolutionary War. Convict labor and slaves were used to build its many forts, the most prominent of which sits next to the cruise terminal and now houses the National Maritime Museum. It is a multicultural country. Offshoring whites and celebrities own much of its prime real estate, but it offers a mixed palette of the species homo sapiens, with Blacks and Portuguese having the heaviest minority influence. For an American, it is tourist friendly. The U.S. dollar is accepted the same as the Bermuda dollar, and U.S. coins work in the vending machines. Getting back on your cruise ship is easy. You just need a photo ID and your room key. The natives are part of the British Commonwealth, but many speak with American accents. You can also hear a mixture of Caribbean accents from somewhat more southern latitudes. I wonder what the natives do for amusement here. It helps if you like the sea because boating and boating related activities like scuba diving and parasailing are popular pastimes. Diving opportunities are plentiful with dozens of shipwrecks to explore among the coral reefs. You can see the island in a day, and take in all its tourist attractions in a leisurely manner within a week. There are a few cinemas, but I doubt an island of 60,000 has a symphonic orchestra, although band concerts in the park at Hamilton happen regularly. The local newspaper is widely read in a way not seen in the states these days. For those with the money there are pricey golf courses, but if you live in Bermuda it helps to like the simple life. Hurricanes are a fact of life here. We dodged tropical storm Emily getting here. The good news is that practical Bermudans have decided to adapt to hurricanes rather than deal with their wreckage. Bermudan houses are practically indestructible, anchored into the island’s limestone, reinforced with cinder block walls and sport white cement roofs ingeniously created to also capture fresh water in a cistern below the ground. Cement roofs and cinder block walls ensure that the houses will still be around after the hurricane passes. Roads and bridges may get destroyed in a hurricane, but the country has otherwise adapted well to these facts of tropical life, proving that engineering can deal with almost any extreme weather situation. It’s a wonder that we don’t require the same sorts of building codes along our hurricane prone states. During our three days in Bermuda we have sampled a fair amount of the island. The city of Hamilton is charming: neither too big nor too small but very compact with many pricey boutiques. There are no Walmarts in Bermuda. No McDonalds, and no franchises of any type except for one KFC in Hamilton. This makes Bermuda a decent place for entrepreneurs, and we encountered some, including a guy who ran an internet café near the cruise terminal. Hamilton, like most of the rest of the island, has houses largely in pastel colors. Apparently there are no restrictions on house colors, but pastel colors work so well here. There are a few tourist attractions. There are caves you can explore. We took in Crystal Caves, which was neat but like the island’s stature compared to the rest of the world, it was modest compared to others we have seen. Their aquarium is respectable but nothing to write home about and their zoo is missing the lions, bears and elephants you sort of expect. The most impressive sites we saw were actually close to the Royal Navy Dockyard where our ship was berthed. The National Museum of Bermuda offers impressive views of the Great Sound and the Atlantic Ocean, along with lacquered over cannons, rusting ship anchors and a museum where, if you can endure the heat, you can learn much about the history of Bermuda, the slaves and convicts who built most of its forts, and the many sailing vessels used here over the years. Bermuda makes an interesting tourist destination, as long as you keep your expectations modest. You are likely to feel charmed by the place. It’s not in the Caribbean per se, but it has all the best parts of the Caribbean without its frequent filth and poverty. The island is on Atlantic Time, so East Coasters like us must adjust your clocks one hour ahead.